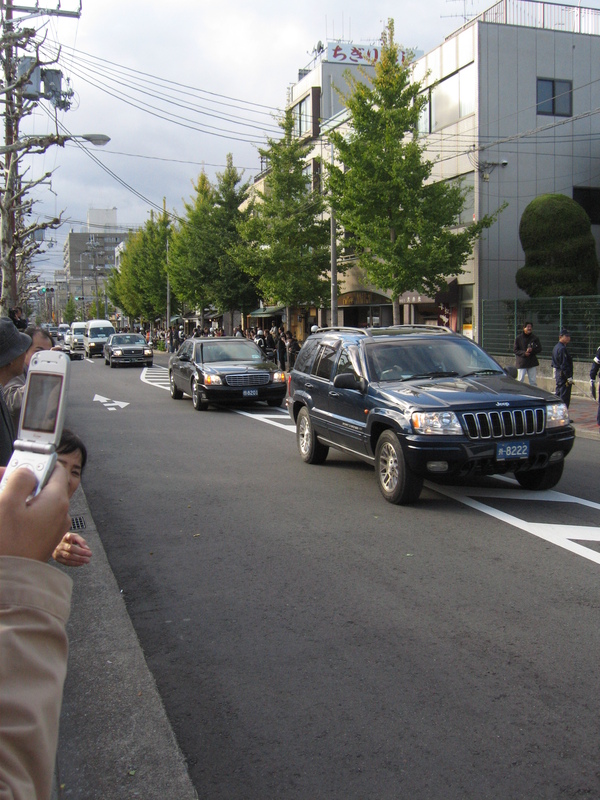 Wow, the Presidential visit was indeed a huge hubbub around here. 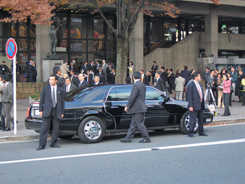 President Bush flew into Japan last night, and helicoptered from the airport into the old imperial grounds here in Kyoto. 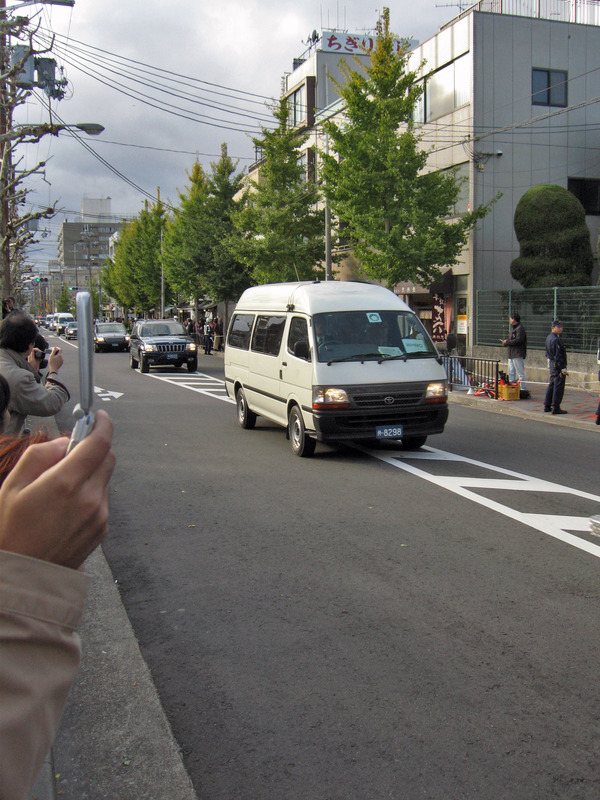 The cost to Japan is not too trivial, either. 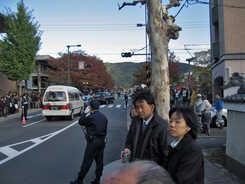 Kyoto brought in over 5,000 extra police officers from all over Japan, and they are everywhere that the President might even think of spitting. Of course, they are quite polite, and for the most part just stand like statues, at least around here. 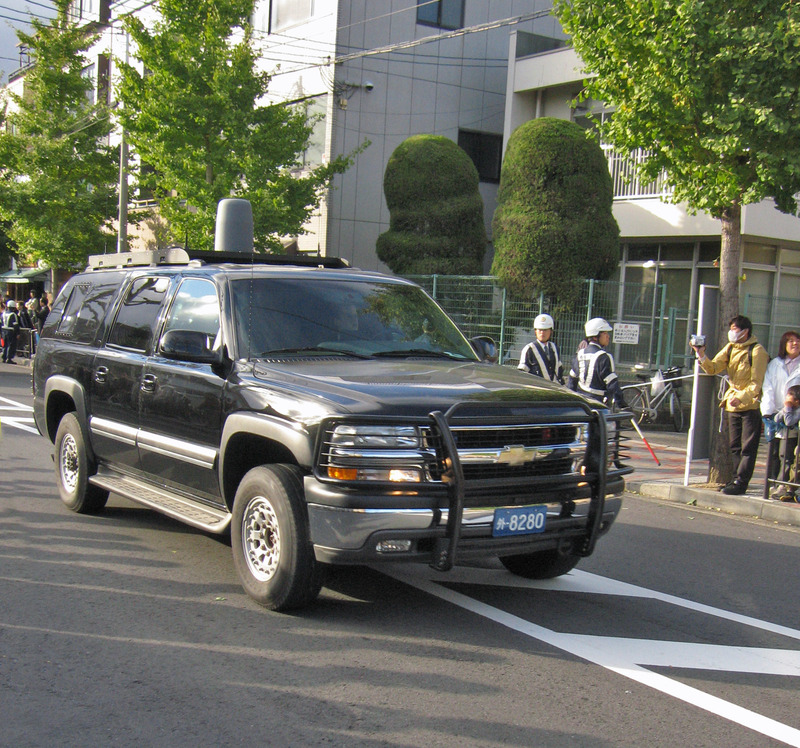 Fumie and Anthony and I took a walk yesterday evening, just around our area (the President was a mile away in seclusion, likely having dinner) and it was crawling with police, and there were big hefty “paddy wagon” urban-assault style busses parked all over. Much to my great embarrassment, I found the hubbub to be of intense interest. For some reason, whenever a helicopter went overhead, I had to run to the window to look. I wanted to see Marine One land and take off (and indeed, I did, from my building's fifth floor exterior hallway, although it was night and hard to see.) 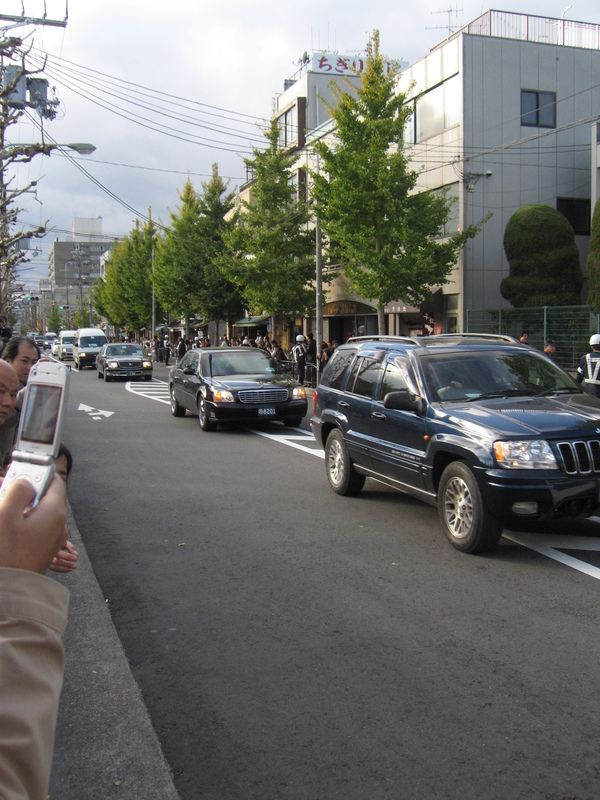 I didn't really care one way or the other to see the President; it was the hubbub itself that I found fascinating. The public parts of the old imperial grounds are basically a huge city park, which was of course closed off. 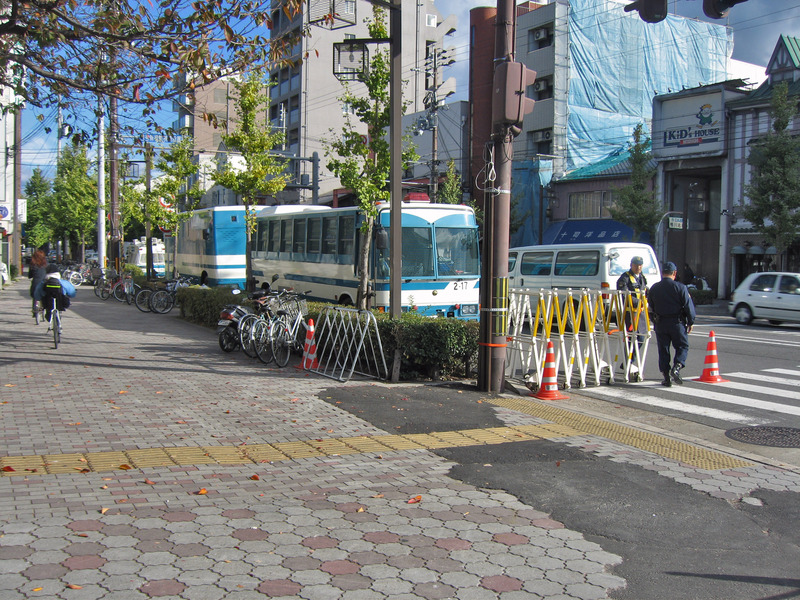 There are many entrances, and each one had at least one (and usually several) of those urban-assault busses. 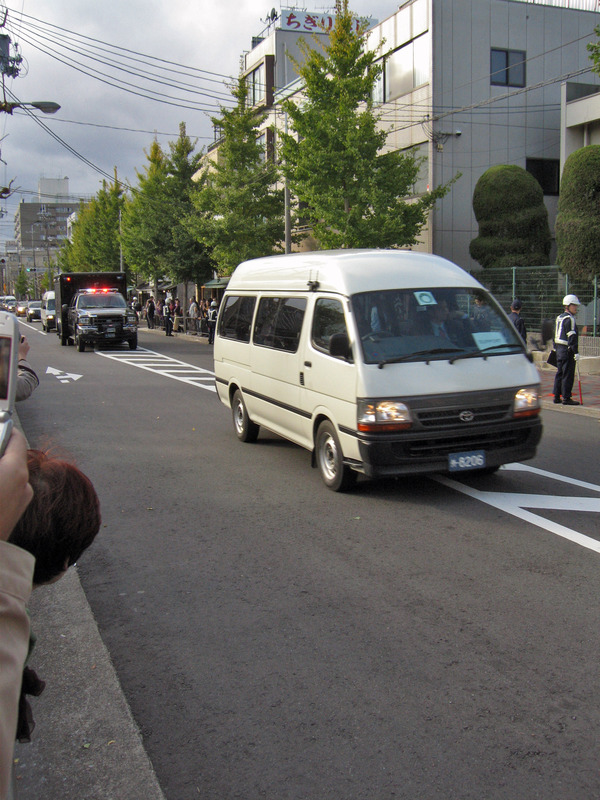 That's in addition to the many such busses parked along the street, full of battle-ready riot police, just sitting there twiddling their thumbs. 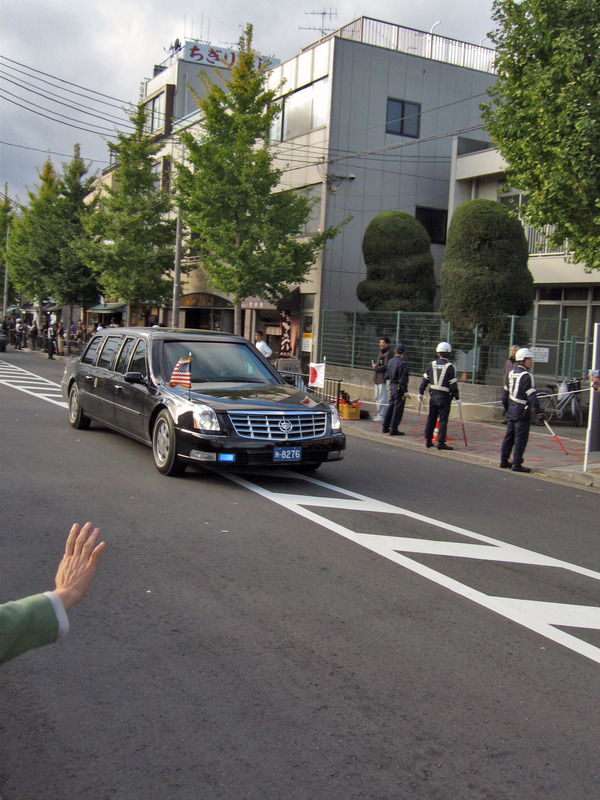 Much to my surprise, I found out in the afternoon (thanks Nils) that the President was indeed coming to my part of the city (giving a speech at the Kyoto Kaikan, which is about 250 yards from my house). 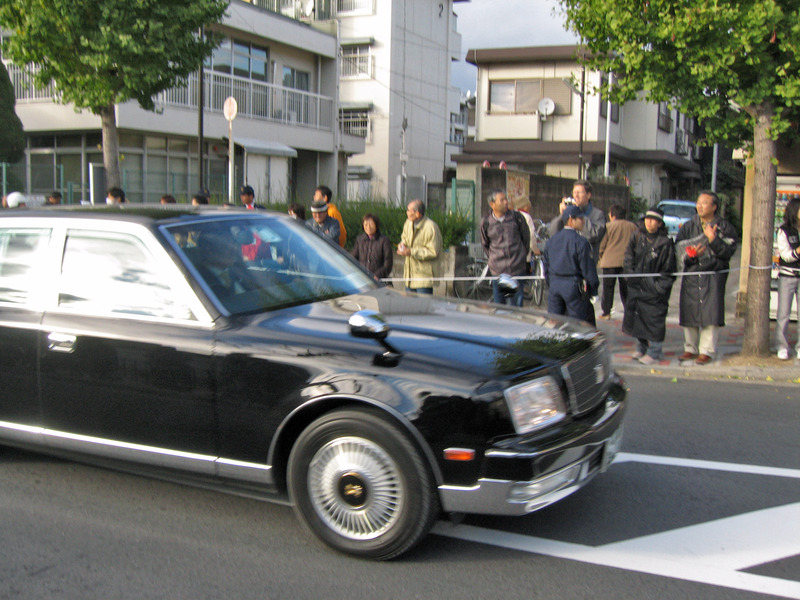 So, I'd be able to actually see the great hubbub of the Presidential Motorcade. Excellent. Of course, the police presence in the area increased exponentially, and two hours before the President was scheduled to arrive (for a 3:25pm speech), the number of police far exceeded the tourists and locals milling about (of which I became one). I spent some time trying to figure out where I could stand — the various police officers (mostly from other parts of the country) gave me different stories about where I could be, but the general impression was that most areas that you might want to be would be off limits. right next to me. Coincidence? 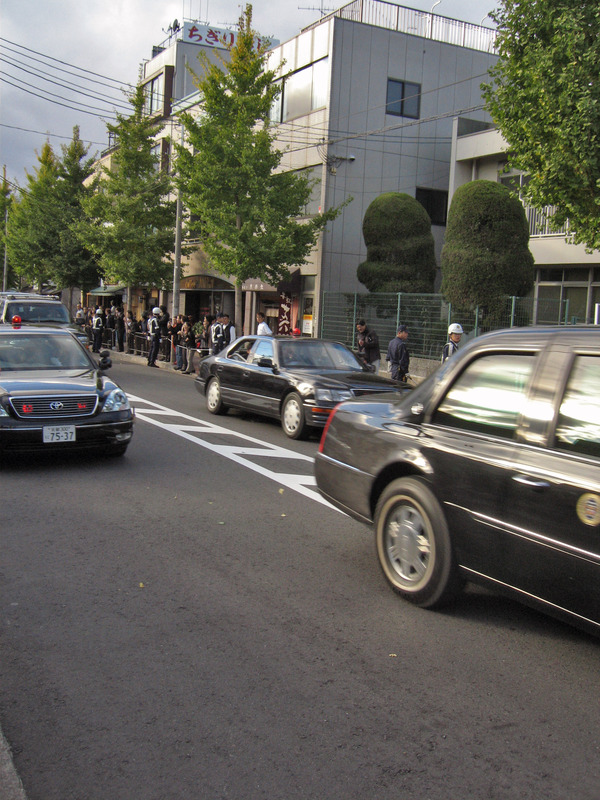 As the time drew near, I moved to my viewing location (on Nijo street, just west of Reisen-dori). Half an hour before the scheduled arrival, there weren't many people lined up yet (and I was the only one who looked like a foreigner), but slowly a crowd gathered. 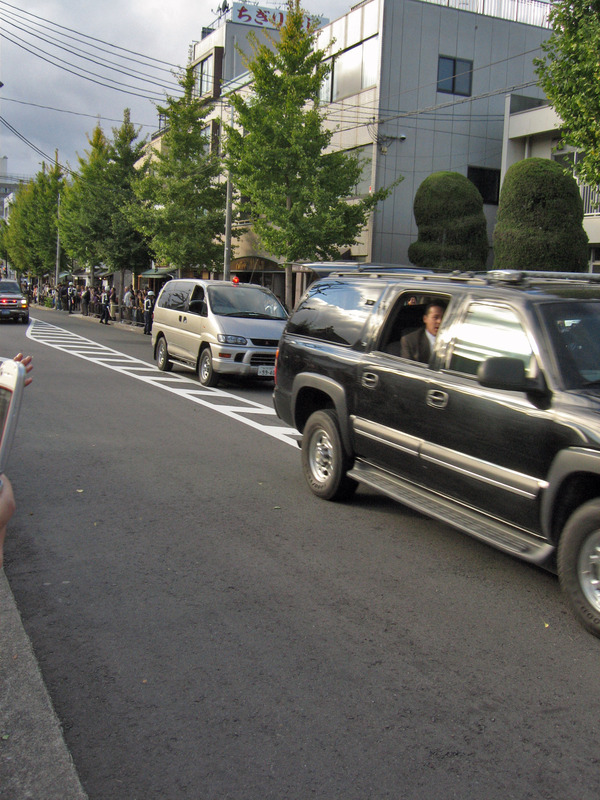 Next to me was a very old man, and next to him a well-dressed couple with cameras (seen here in the picture, which is aiming where the motorcade will go). I took one look at the lady's perpetual scowl and knew that they were plain-clothed police officers pretending to be tourists. Indeed, a bit later I noticed he'd put a mini earphone into his ear. I smiled at them, but they never smiled at me. The first (and only) unfriendly officers I ran into. 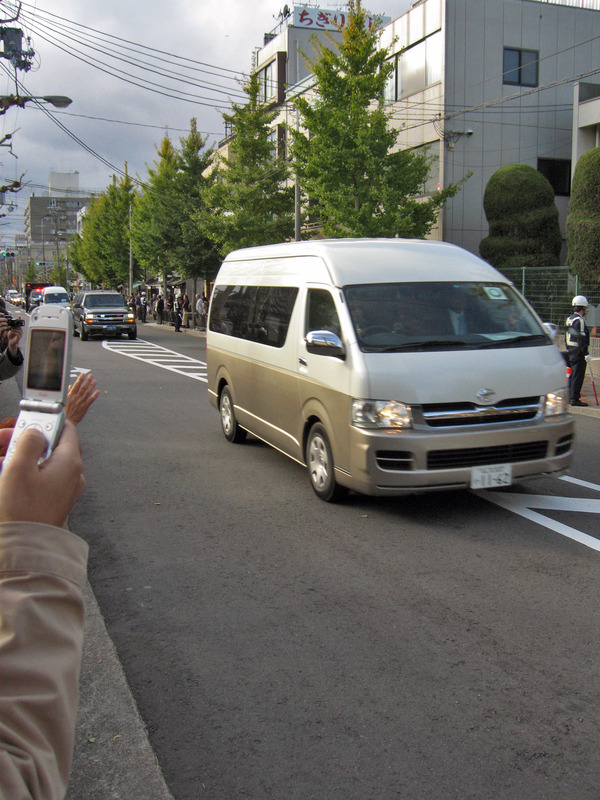 Eventually, the motorcade came. 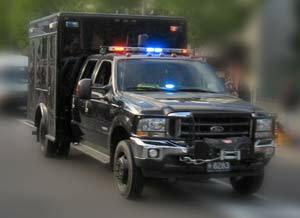 The first thing I noticed (while it was still some distance away) was the telltale blue flashing lights (along with red) of an American law-enforcement vehicle. 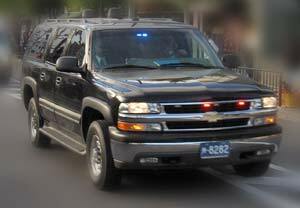 In America, such blue lights are illegal otherwise. 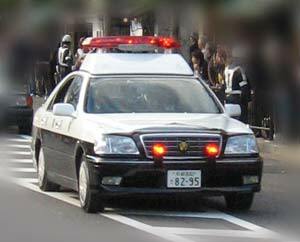 In Japan, law-enforcement and emergency vehicles use only red lights (garbage trucks tend to use blue), but it seems that anyone can have any flashing light they want on their vehicle. 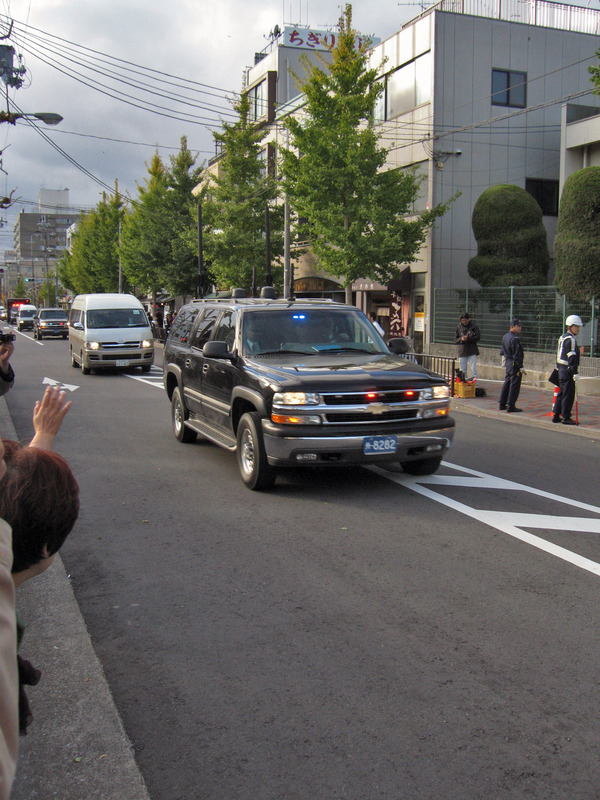 Anyway, the blue and red of the motorcade cars were distinctly American. Cars #5 & #6. 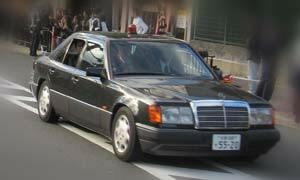 Immediately behind limo #2 came these two Japanese police cars, driving “in the wings”. 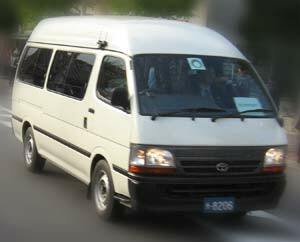 Car #7. 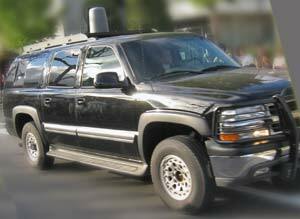 Next came a black Chevy Suburban with Secret Service poised, literally, to jump out. 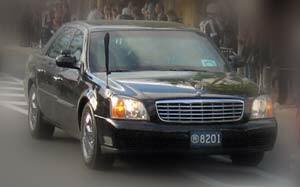 Like the Limos and other vehicles offloaded from the C5 Galaxy cargo plane, they had blue “outsider” license plates attached by Japanese authorities upon their arrival. 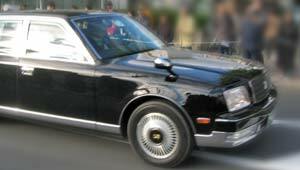 Car #16. 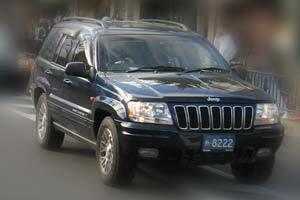 The Jeep above seems to be with this Important Person's car. 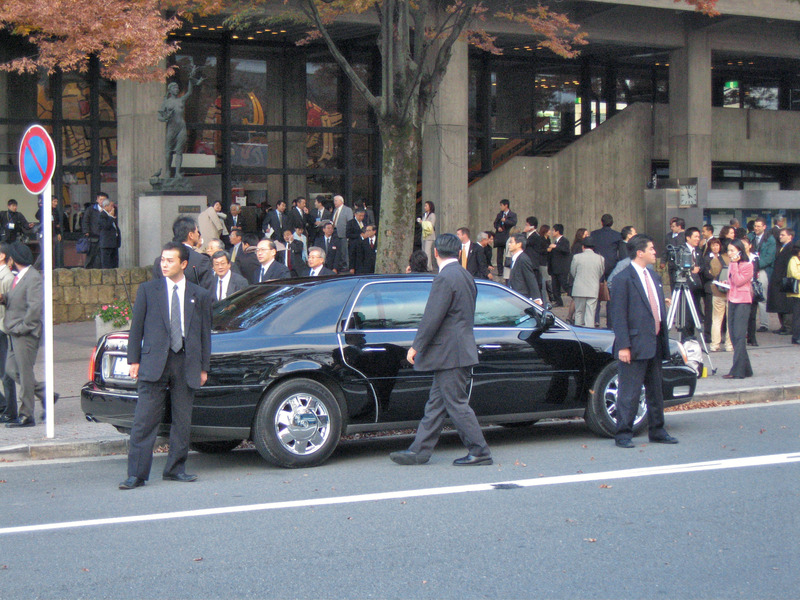 Later (after the speech), I saw someone looking suspiciously like John Thomas Schieffer (US ambassador to Japan) getting in this car, surrounded by a bunch of Japanese security. Up to this point I'd had my camera on rapid fire, but what followed were just a bunch of vans and probably more Black Suburbans, so I stopped taking pictures. 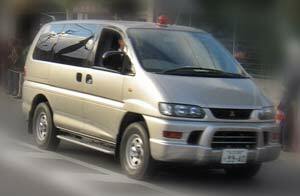 Car #19+. 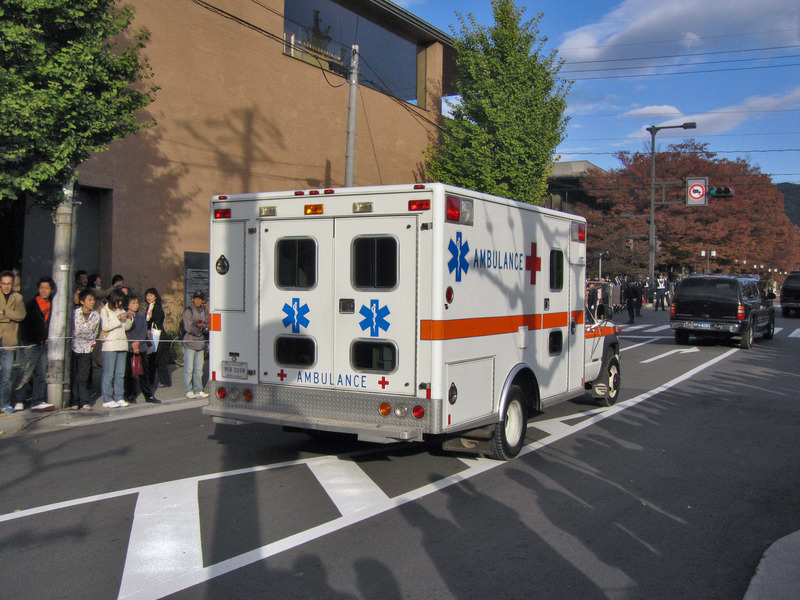 As standard an American ambulance as you can get. 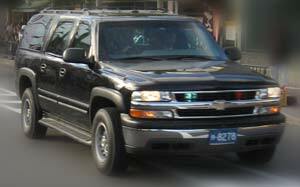 It had Maryland plates on the back, but Air Force plates on the front. Probably brought up from a US military base in Japan? 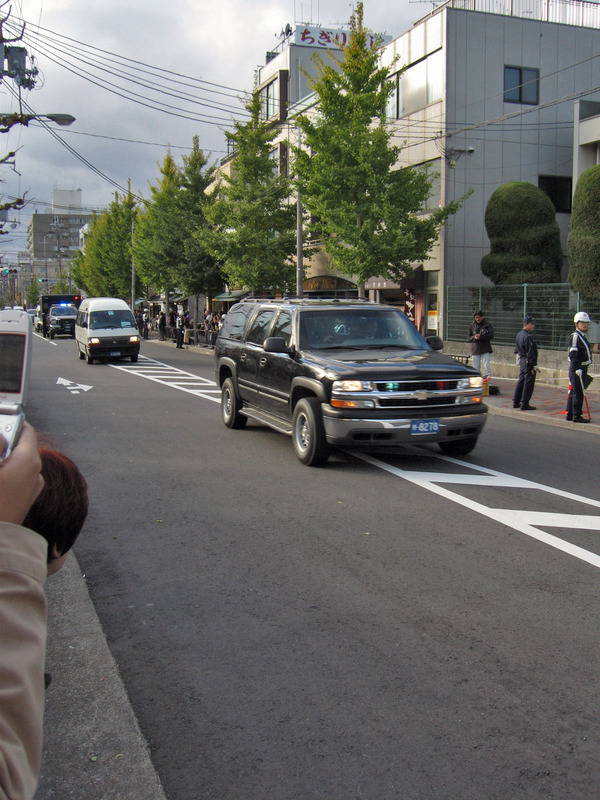 I went home for a bit, then went back out just in time to see the motorcade speeding away. 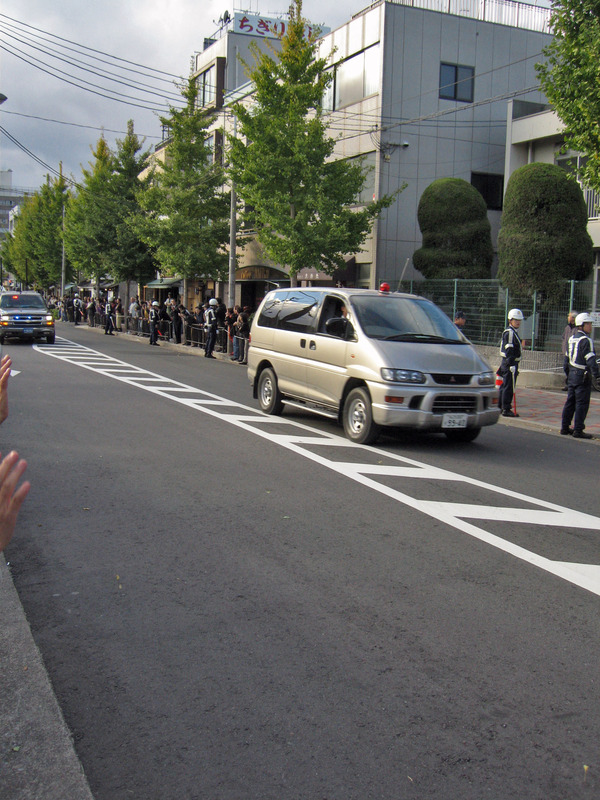 Moments later, the police started to pack things up, and the crowd that attended the speech (who?) started coming out of the building. Soon, the entire police presence that had been building since last week vanished, and by the evening all the barricades and such were gone, too. I have no idea why I found all this hubbub — looking at the comings and goings and the security and such — so compelling. It was distracting, and I'm glad it's over (he's in Korea already), and I'm glad I've written about it so now I can get the damn thing off my mind. 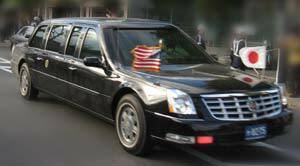 Have you ever seen the NOVA documentry about all the prep work the secret service does when the president goes anywhere? It’s pretty amazing. Of course, they don’t provide any notion of what the associated costs are. I suspect we’d be shocked to see how big that number is. Yes, the taxpayer’s money. 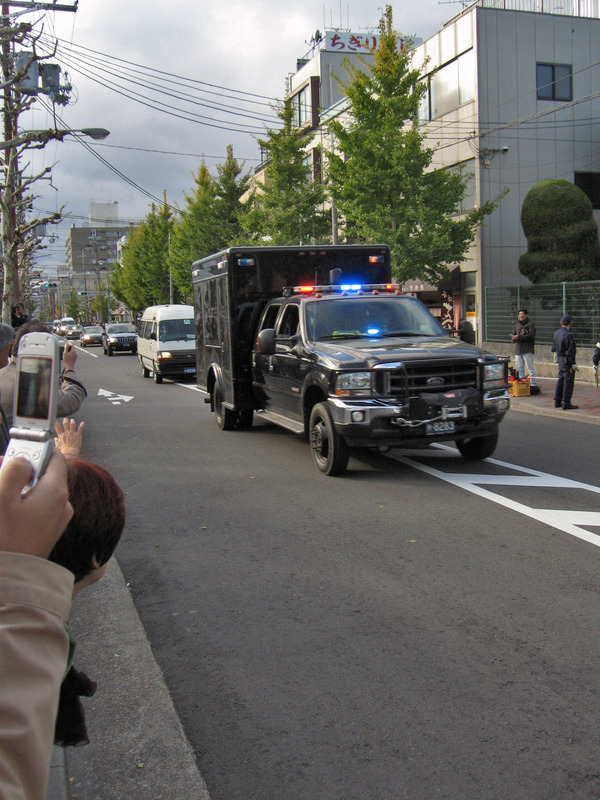 The taxpayer’s money. I cry for my daughter. I guess she’ll be living with us for the rest of her life because of the taxpayer’s money. Republicans are stereotyped as fiscally conservative and socially conservative. Here we have a fiscally “liberal” and socially conservative Republican. No wonder few like him–here AND abroad (from a U.S. centric perspective). Anyone with half a brain must wonder what US voters are thinking…. I know I am. 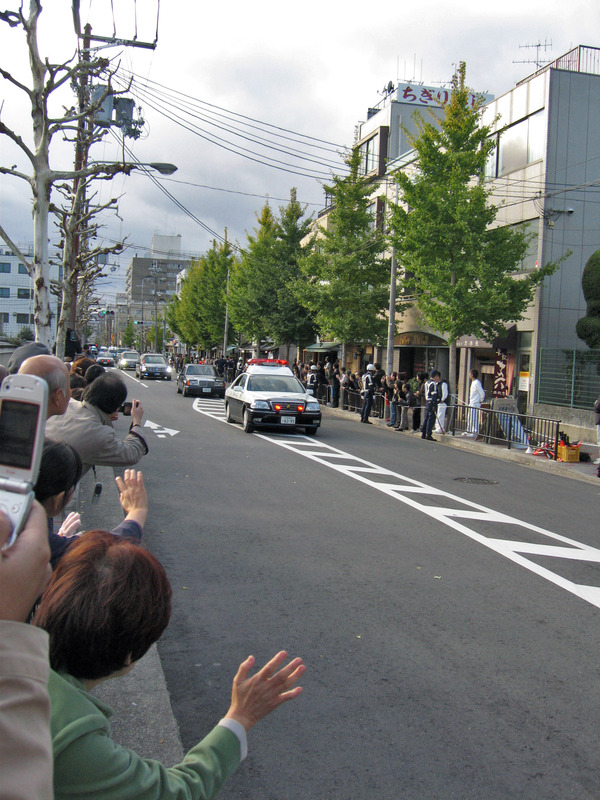 The only reason I don’t move to Japan is because pop culture there doesn’t seem to be much better than in the U.S. I really enjoyed the contents of your website. They are really informative. You have made it fun for the readers, and indeed you has “blended” everything, i.e. culture, education, freedom (of expressing your thoughts), etc. 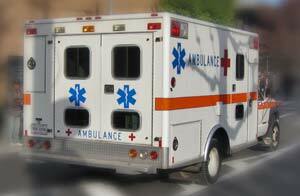 all together in your website format. 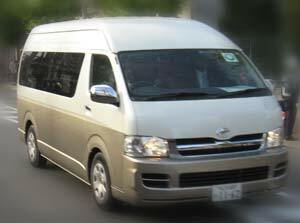 Your sharing about your family, social life, and daily life activities there in Japan has helped me a lot in understanding Japan. THANK YOU FOR SHARING. 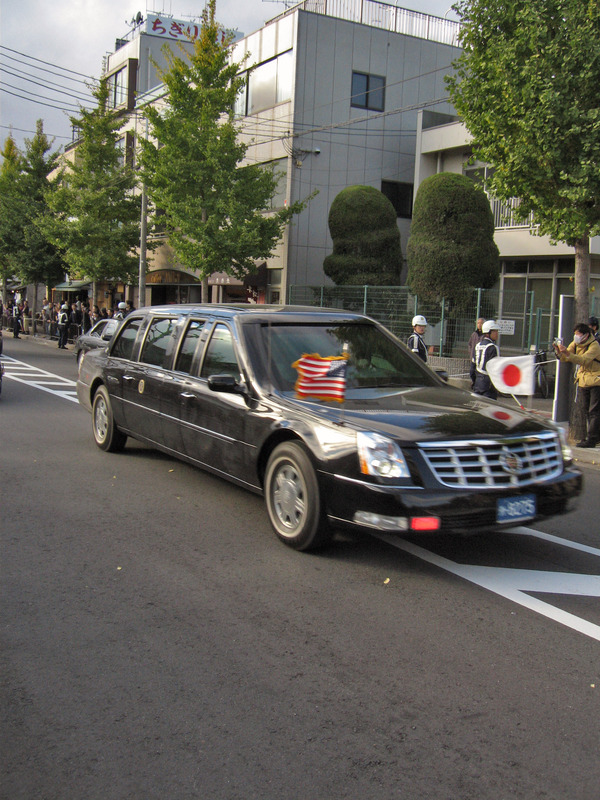 For the cost of the President’s visit to Japan, I think it was worthwhile. Having accepted to the U.S. as a refugee from Vietnam 31 years ago, and embraced her as my country, I am very proud of the President and my country. 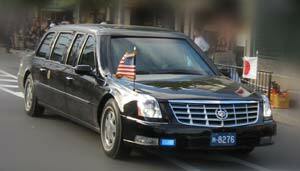 To my opinion, regardless of what we think about our President, we need to take good care of our President, especially when he is visiting other countries. He is representing us, and we should be proud of this fact. 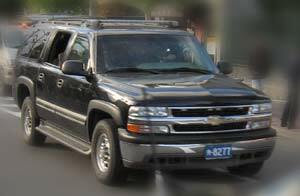 just to let you know they’re not called “ford suburbans”……they are actually chevrolet suburbans or “chevy”……ford has a similar SUV called the expedition but it is not the one pictured. 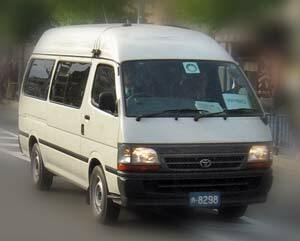 It’s C5 Galaxy, not C4.